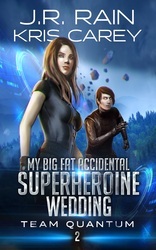 Yes, Giancarlo and Mira - two "accidental superheroes" produced in a freak physics accident - may be on the lam with the FBI in hot pursuit. AND their powers may be slowly fading. But they've got something stronger keeping them a step ahead of the bad guys: LOVE - and, fortuitously, the discovery of a NYC-based superhero support network. But will they survive long enough to say "I DO"?